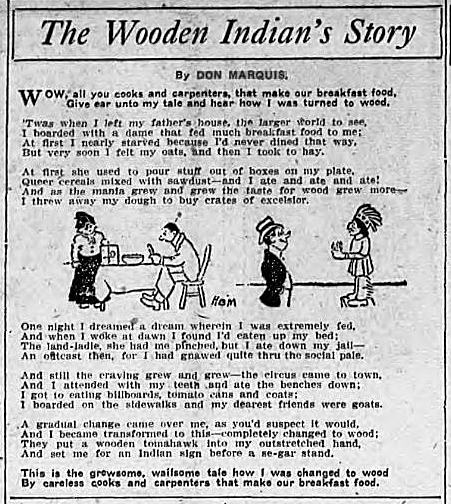 “The Wooden Indian’s Story” is one of those pieces. Like much of Don’s later work, humor is a veneer on news of the day — in this case revelations of breakfast cereals being routinely adulterated with sawdust filler. The poem ran in the American on January 17, 1910, and was then syndicated to newspapers across the United States via Hearst’s news service. Don’s friends in the South got a chance to read it when the poem appeared January 22, 1910, in the Atlanta Georgian and News (the source of the image here). And then fate intervened. Without explanation, he was fired after just a few months on the job. Don’s wife, Reina, was also a talented writer, and together their freelance work got them through the next several months. By the end of the year Don was on the staff of the Brooklyn Daily Eagle, and in January 1912 he moved to the New York Evening Sun. But we’ve gotten ahead of our story. 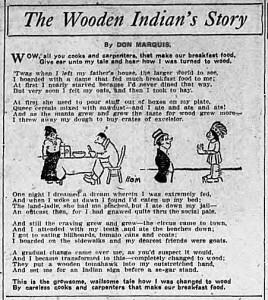 In January 1910, “The Wooden Indian’s Story” carried Don’s hopes and dreams of a new life in New York. The poem has never been published since it first appeared 103 years ago; it’s time for another look. Give ear unto my tale and hear how I was turned to wood. But very soon I felt my oats, and then I took to hay. Queer cereals mixed with sawdust – and I ate and ate and ate! I threw away my dough to buy crates of excelsior. An outcast then, for I had gnawed quite through the social pale. I boarded on the sidewalks and my dearest friends were goats. And set me fore an Indian sign before a se-gar stand. By careless cooks and carpenters that make our breakfast food. This entry was posted in News and tagged Atlanta, Don Marquis, New York, New York American by John. Bookmark the permalink.